I’ve been on the Kay Brothers mailing list for some time. The Block 6 Shiraz was the main reason – I tasted it first at a wine club dinner when I was a mere baby, and was impressed by its over-ripe richness and power – a style I was unaccustomed to at the time. As the mailing list has grown and the allocations of this wine have shrunk (and the price has crept up accordingly, although still reasonable) I have in more recent years been buying some of the Kay’s whites and cheaper reds to offset. In a recent cleanout of the cellar I found three bottles of 2007 Riesling so I chucked one in the icebox to give it a burl. McLaren Vale is not exactly the epicentre of fine Riesling, thus the fruit for this wine is sourced from 60 year-old vines in Eden Valley. I approached this casually and with less-than-the-usual vigour. I’m happy to say I was pleasantly rewarded. Slightly yellowing straw colour. The nose offered a whole bunch of interesting aromas – from oily kero to damp straw to plummy nashi pear to potpourri and lavender. Probably the wildest descriptor I pencilled down was ‘sweaty vinyl upholstery, crushed ants, balsa-wood, and a handful of pine needles’. I’m smelling it again and I can wholly vouch for that one. There’s a smoky hint, and some citrussy lemon and a little green peach too. I love an oily palate. This one has it in spades. The acid has been backed off, or diminished with time in bottle, and there’s an enjoyable creaminess going on. Flavour-wise I’m initially hit with salty green peas, giving way to some lovely, sweet grapefruit and lemon juice, and a fine line of minerality. There’s good weight, there’s depth and great length, and with a piece of grilled Snapper and some home-made chippies it went down a treat. An unexpected pleasure from a producer not renowned for its cooler white varietals. Riesling and fish is usually a good mix, especially if you use ingredients that complement the flavours/aromas of the wine. Like lemon juice, thyme, pepper. 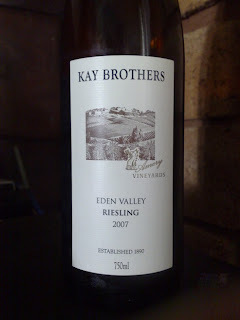 I reckon I’ll grab some more Kay’s Riesling next order. Value: Cellar door price was $20 if I remember. Just about right I reckon. Producer: Kay Brothers – www.kaybrothersamerywines.com – established 1890, famous for their Block 6 Shiraz produced in small quantities from 100+ year vines. Vintage: A short, sharp vintage in 2007 due to the warm and dry winter/spring. Some bodgy weather at flowering and a lack of water approaching vintage reduced yields. An average year.